Yesterday I put up a piece reporting the sad death of British comics legend Steve Dillon, along with his obituary from the I newspaper, and a link to the Nick Fury strip he drew for Hulk comic right at the very beginning of his professional career in comics, which can be read over at the Bronze Age Blog. Amongst the other gems from the Bronze Age of Comics – the 70s and 80s is one of the strips Alan Moore created for the music newspaper, Sounds. Written and drawn by Moore under the monicker, Curt Vile, this was The Stars My Degradation, and ran in the magazine from 1980 to 1983. This was about the space adventures of Dempster Dingbunger, and featured such characters as Three-Eyes McGurk and his Death Planet Commandos, Nekriline, who was literally dead, Laser Eraser, the deadly galactic female assassin, and the psychotic cyborg, Axel Pressbutton. Laser Eraser and Pressbutton were later to get their own strip in the British adult comic, Warrior. The strip there, if I remember correctly, was drawn by Steve Moore, no relation to Alan, under the pseudonym Pedro Henry. Moore was another stalwart of the British comics industry, and closely involved with the Fortean Times, the magazine of the weird and bizarre. The strip’s title, The Stars My Degradation, seems to me to be a satirical nod to Alfred Bester’s classic, The Stars My Destination, also known as Tiger, Tiger. It was one of the pieces Moore created very early in his career, just before he broke into mainstream comics and became the massive legend he is today with V For Vendetta and Watchmen. Pete Dorree notes that the strip was nihilistic and satirical. In the example he gives, Moore spoofs the New X-Men, created by Chris Claremont and Johnny Byrne. Here’s the link. Enjoy! According to an article in The Canary last week, the government is considering passing legislation to allow the rozzers to interview suspects in the street instead of in an interview room back at the cop shop. These interviews will, however, be recorded by bodycam. Pilot plans to allow police officers to interview suspects on the streets via body cameras, rather than at police stations, has raised concerns among civil liberties groups. Currently, while the formal caution that police recite when arresting somebody states clearly that anything they say may be used in evidence against them, officers are not formally able to interview someone until they have been taken to a police station. Crucially, once at the police station, the suspect has the right to independent legal advice, and they are entitled to pre-interview disclosure. This pre-interview disclosure is vitally important as it is designed to ensure the person and their legal representative understand why the person has been deprived of their liberty, the nature of the allegations made against them, and the reason why they have been arrested. Without this disclosure, and access to a solicitor, the suspect is extremely vulnerable, especially if unfamiliar with the complexities of the law. The emphasis seems to be most definitely on cheaper justice, with fairness coming a very poor second. The article quotes two critics of the scheme, who point out that current practice is based on decades of experience of the abuse of police powers. And that the people, who will suffer through this innovation won’t be the experienced, hardened crims, but inexperienced suspects unsure of their rights and the law. A number of points can be made here. Firstly, there’s the danger of serious breaches of justice in allowing the police to interview suspects away from the interview room and the presence of a lawyer to represent them. The government seems to think that allowing the interview to be recorded by bodycam will somehow be an acceptable substitute for removing established procedures involving formal, recorded interviews. It looks simply like they’re desperate to get convictions, and are willing to use this technology as a pretext for removing established judicial safeguards. Hey, it’s all recorded on camera, so it’s properly supervised. It can be wrong, can it?’ This seems to be the attitude. It also shows how the government seems to be believe that increased surveillance technology is automatically a solution. Now, I’m very much aware that there is the view that Paris was targeted by ISIS for their butchery, instead of London, because the City of Light had much less CC TV coverage. But surveillance cameras, as the French also knew, carried their own dangers of creating a pervasive, surveillance state. Alan Moore when he wrote V for Vendetta in the 1980s placed surveillance cameras on the streets in his Fascist future Britain, thinking that this would really scare its readers. Well, it’s now thirty years or so after the strip, and surveillance cameras are everywhere and no one takes any notice, a fact the great man himself has remarked on. I’m sure surveillance cameras have an important use, but they should be adjuncts to, not substitutes for, traditional policing. I also wonder what will be done about recorded interviews in which the individual is left off without charge. Will they still be retained? What about a person’s right to privacy, and not to have the state keep records on them when they are innocent? There have been cases where innocent citizens have found that the rozzers have continued to keep files on them even after they were released and declared innocent. I’m very much afraid something similar could happen here. And there is the danger of the wider misuse of such technology as the Tories make Britain become ever more authoritarian and Fascistic. Way back in the 1970s the police were required to compile useful intelligence on potential suspects. This ended up with the bluebottles deciding someone was suspicious, based no more on the fact that they were a Punk, or a pregnant teenager. And one of Cameron’s brilliant ideas was for the cops to take the names and particulars of strikers on picket lines. He’s had to climb down on that, but given the backing the Tories have always received from rabidly anti-union groups, I doubt believe this has gone away. Not completely. So there’s a real threat to civil liberties there. And lastly, there’s the rather more fantastic threat that this is the start of something like the Borg. They’re the cyborg race from Star Trek, who have merged into a single, collective intelligence – a group creature, so that their society resembles a giant ant’s nest. We’re nowhere near that level of cybernetics yet, but one of the more interesting comments about the Google Glass computer spectacles was that it practically made the wearer one of the Borg. Google Glass were the hi-tech specs that allowed you to surf the internet while walking about, and for your on-line friends to see what you were seeing. I can remember back in the 1990s there was a similar experimental arrangement being tried out by the computer geeks at one of the American unis. A friend of mine, who played Shadowrun, a Dungeons and Dragons-type game based in the world of cyberpunk and computer hacking, seemed unsurprised when I told him about it. He called the technology and the people who used them ‘gargoyles’, which was the term used in the game for people, who used cyberspace technology to experience the sensations experienced by another person. So, in the game’s parlance, this technology effectively makes the rozzers the justice ministry’s gargoyles. And with others seeing what they see, it’s almost ‘1984’ and the Borg. It’s just that they haven’t been mentally connected to the internet yet, so they aren’t yet like the Robomen of the Dalek Invasion of Earth. But it’s early days yet. Give the Tories time. They are Borg. Resistance is futile. We will be assimilated. They point out that a lot of Western movies are available in China anyway, and it might simply be due to a new Chinese leader taking power. My guess is that it’s possibly been screened because it’s such a cult film that attempts to stop people seeing it have largely failed. It’s also possibly been made palatable by the fact that the totalitarian state is a Fascist, 21st century Britain. Even so, the precise shade of political party and geographical location shown in the movie doesn’t alter its anti-authoritarian message, or make much of it any the less relevant. China is a one party police state, which incarcerates and tortures its political prisoners. The scenes in which the guards and staff at the concentration camp are shown disposing of the bodies of hundreds of victims of human experimentation will, amongst older Chinese, recall the mass deaths that resulted from Mao’s Cultural Revolution. China is also a state that robs its criminals of their organs for transplant surgery before they are executed. Thus Chinese prisoners are the victims of forced medical procedures in that way, another, though possibly not an exact parallel to the horrors in the movie. The film is similarly set after there has been a holocaust against Muslims, resulting in their extermination and the outlawing of their religion. China similarly is cracking down on its Muslims, and many of the country’s indigenous Muslim ethnic groups, like the Uyghurs, feel that they are being systematically dispossessed, marginalised and persecuted in their home province of Sinkiang. Among those sent to the concentration camps are homosexuals. In one part of the movie, Natalie Portman’s character is incarcerated to make her experience what the state’s victims go through. During her incarceration she reads letters written by Valerie, a lesbian, who really was rounded up by the regime for her sexuality. I don’t know if homosexuality is illegal in China, but it certainly is in other Asian societies, such as Singapore, and strongly disapproved of in many nations where it is legal, such as Japan. My guess is that it is illegal in China, and that this will be another uncomfortable parallel with the current regime. But whatever the oppressive government, the Turks’ point out that the film does have a universal message that people should not be afraid of their governments. Governments should be afraid of their people. As our government tries to shut down the Freedom of Information Act, it’s plain that they are. Very. 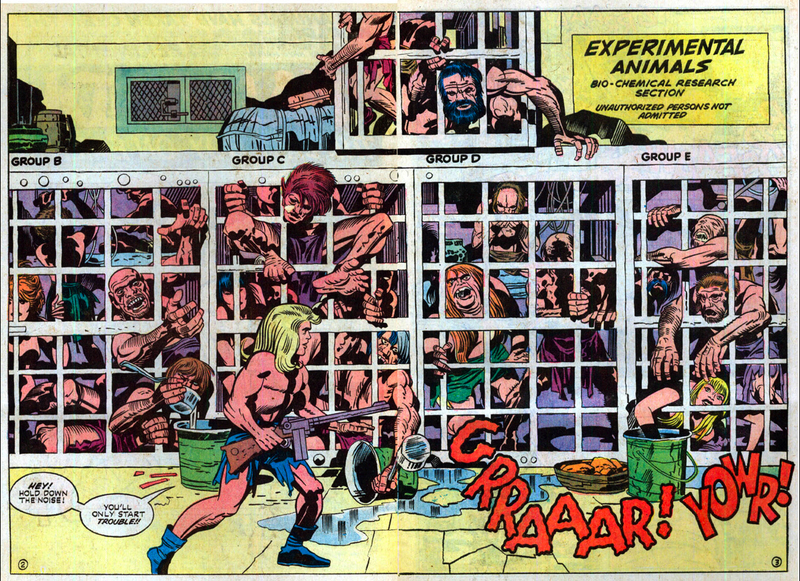 A page of classic comics art depicting humans as experimental animals. I got it from the 70s Sci-Fi art page on Tumblr. Not quite the image IDS wants to project with his comments about the disabled as ‘Stock’. This is another book review, which reveals something of the dark history of human medical experimentation by the military in this country. It’s a review of Secret Science: A Century of Poison Warfare and Human Experiments, by Ulf Schmidt (Oxford: Oxford University Press, 2015) £25, h/b. This is the type of book the Daily Mail really hates. As their blustering against the Brazilian human rights rapporteur shows, one of the many irritants that really send the Mail into a xenophobic screaming fit is when foreigners dare to criticise Britain’s increasingly poor human rights record. Their usual response is to accuse the foreign critic, whether judge, human rights activist, whatever – of hypocrisy, and to try to smear them by pointing out the human rights abuses in their countries. That won’t work here, for the simple reason that Mr Schmidt is professor of Modern History at the University of Kent, and has been Wellcome Trust’s Post-Doctoral Research Fellow at St. Anthony’s College, Oxford. He has also published several works on Nazi experimentation on humans during the Third Reich, such as Medical Films, Ethics and Euthanasia in Germany, 1933-1945 (2002), Justice at Nuremberg (2004), and Karl Brand: The Nazi Doctor: Medicine and Power in the Third Reich (2007). He is clearly very definitely both a senior, respected academic and someone, who has not been afraid to confront his country’s Nazi past, and the experimentation on humans there that would make most civilised people sick. Also, as an academic text, the book is far outside the type of book the Daily Mail and its readers are likely to read or review. And so you can be quite sure that the Tory press are very definitely going to ignore it. Much of the book is about the experiments on humans to judge the effect of chemical and biological weapons. Although the book includes America and Canada, much of its focus is on Britain and the research carried out by Porton Down. Schmidt acknowledges that the soldiers upon whom the experiments were carried out were volunteers, but raises the awkward question of whether they were properly informed of the possible consequences of the experiments. Several squaddies have died and many left seriously disabled. He mentions the case of one serviceman, Leading Aircraftman Ronald Maddison, who died after being exposed to Sarin in 1953. If the death alone was not scandalous, there is the fact that it took his family fifty years to find out the true circumstances of his death. He also notes that the Americans were interested in the resistance of different racial groups to mustard gas, and that Porton Down released a ‘plague-like bacterium’ on to the underground in 1963. The review also states that the book also has a lot of loose ends and opportunities for further research. Like the case of British officers, who were sent to investigate Nazi medical experiments and the gassing of the Jews for Nuremberg. Nobody, however, seems to know what they did with the information and there remains a strong possibility for an ‘Operation Paperclip’, in which the Nazi doctors involved were recruited by their former enemies. He also discusses how Porton Down followed America in pursuing research into the military application of LSD, like the US’ MKULTRA. One of the doctors involved was an American, who sought other human guinea pigs amongst the mentally ill shut up in America’s psychiatric wards. The book’s reviewer, Frewin, discusses the possibility that some of the British doctors mentioned in the book seems just as shady. He raises the possibility that one of two of them were conducting similar experiments over here. It’s interesting that, just as this book’s been published, Points West, the Beeb’s local news programme for the Bristol, Somerset, Gloucestershire and Wiltshire are did a feature on Porton Down and its history. It seems the facility had been making some kind of public outreach, which looks like a bit of PR to allay possible public fears. Rather more disquieting is the way Ian Duncan Smith referred to disabled people as ‘stock’, and suggested that the poor could make money by offering themselves for medical experimentation. Mike over at Vox Political pointed out that his was very close indeed to the attitude of the Fascist doctors experimenting on humans in the dystopian future Britain of V for Vendetta. 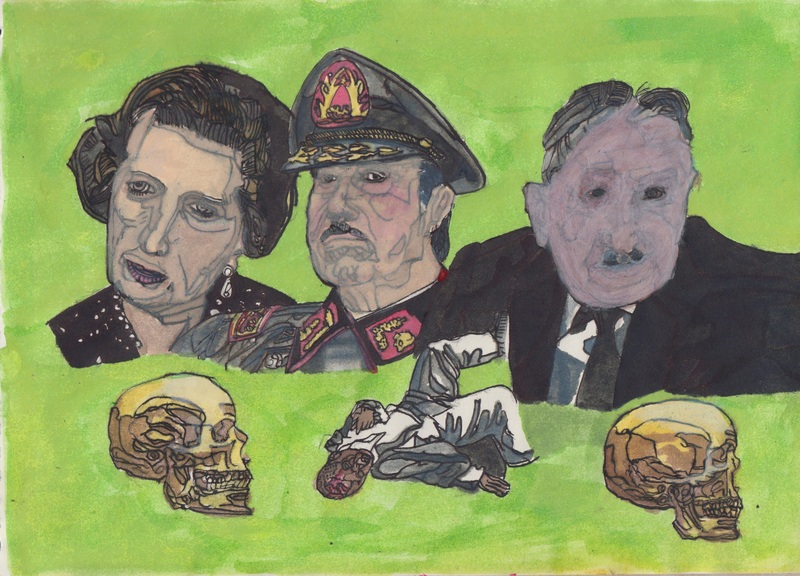 There’s a problem here in pursuing research into human experimentation in Britain by the massively secretive nature of the British political establishment. Americans were informed about the true extent of their nation’s experimentation on service personnel, the poor and disadvantaged racial minorities with the passage of the Freedom of Information Act by Clinton in the 1990s. This resulted in the release of a torrent of declassified documents revealing a very dark history of drug and nuclear experimentation, frequently on people, who had no knowledge of what was being done to them. One of the documents revealed how an Indian woman was regularly injected with radioactive material at a nuclear facility, which she was led to believe was a hospital and the doctors were treating her for cancer. It’s secret history that forms the basis for American conspiracy culture and the massive suspicion many Americans feel towards their own government, from Alex Jones and Info Wars to the type of people portrayed in the X Files in the form of the Lone Gunmen. The problem is that, for all America’s faults, they are a much more open society than Britain. Possibly because of its origin in aristocratic political discourse, where important decisions were to be kept to responsible gentlemen in smoky rooms, and the proles kept at arms length, the British state has always been very reluctant to divulge any kind of potentially embarrassing information. It might upset confidence in the Establishment, as well as cause some ex-public schoolboy various other ministers and civil servants went to school with to lose his pension and his career. It was, for example, only a few years ago that Britain acknowledged the true extent of the terror tactics it employed to quell the Mao-Mao rebellion in Kenya. Blair’s passage of a British version of the Freedom of Information Act has done much to make the British states less secretive, more open and transparent. This is, however, now being undermined by the Tories and their collaborators in this from New Labour, like Jack Straw. So we probably don’t know the true extent of human experimentation over here. Another factor that makes me wonder if we ever will is that at the time some of these experiments were performed, Britain still had an Empire and the tests were done in some of our former colonies. Nuclear weapons, for example, were tested on south sea islands. So many of the victims may well now be the citizens of independent nations, and so considered less important and more easily ignored than British citizens.